The Shoalwater and Corio Bays Area Ramsar site has a subtropical climate with temperatures ranging from a mean monthly maximum of 32 degrees Celsius. in January, to a mean monthly minimum of 10.5 degrees Celsius in July. Rainfall is highly variable with approximately half of the rainfall falling in the first few months of the year. The Ramsar site contains a wide range of landscapes including undulating lowlands and hills, riverine plains, sand dunes, mountains, sandy beaches and coastal cliffs. A number of small rocky islands found off the east coast are also part of the Ramsar site. Of particular note is the parabolic dune system which represents a good example of a relatively undisturbed and extensive Holocene dune formation. The dunes also contain perched or elevated wetlands, which can contain peat swamps with peat layers over one metre thick. A number of sinkholes can also be found throughout the dune systems, some of which contain freshwater springs and rainforest vegetation. 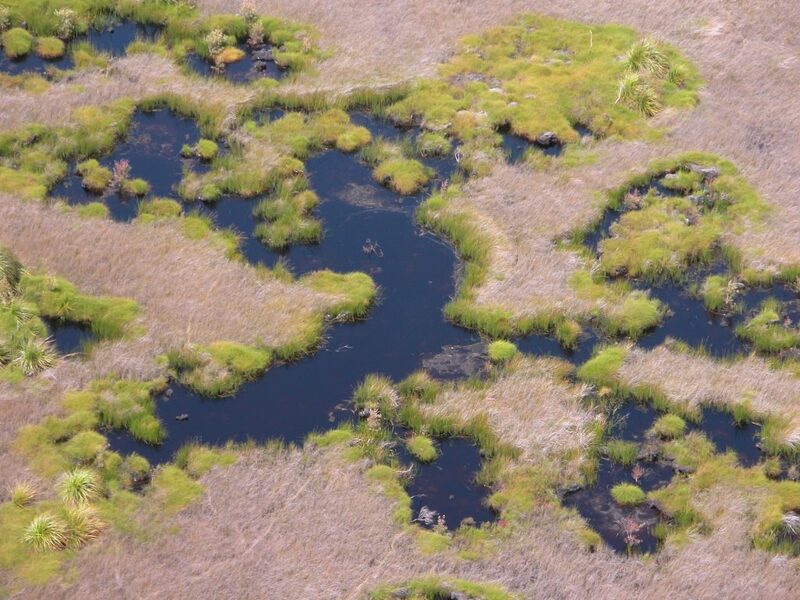 Peat swamp located on sand dunes. Image courtesy of Roger Jaensch. The Ramsar site also spans over a large variety of surface geology types. These include rocky surfaces on the offshore islands and rough shores, and muds and sands in the more protected bays and coastlines. The highly variable rainfall of the region has a major influence over the hydrology of the Ramsar site. This variable rainfall means many of the creeks in the Shoalwater Bay section of the site hold water occasionally with flows mostly occurring in the Summer wet season. 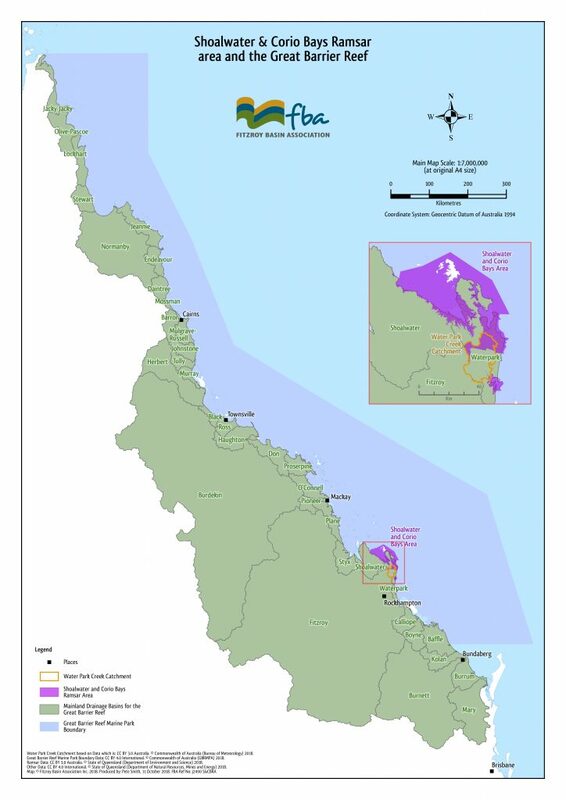 The two main freshwater catchments of the site are: the Great Barrier Reef Marine Park Catchment and the Water Park Creek Catchments, which drain Dismal Swamp (located amongst the dune fields). The relatively undisturbed nature of the Ramsar site means that the waterways of the site are heavily vegetated and not impacted by development. The Ramsar site experiences the highest tidal range on the eastern coast with around 5-6 metres variation at Port Clinton. This large tidal range has led to the formation of extensive tidal ecosystems such as sand flats and mangroves. 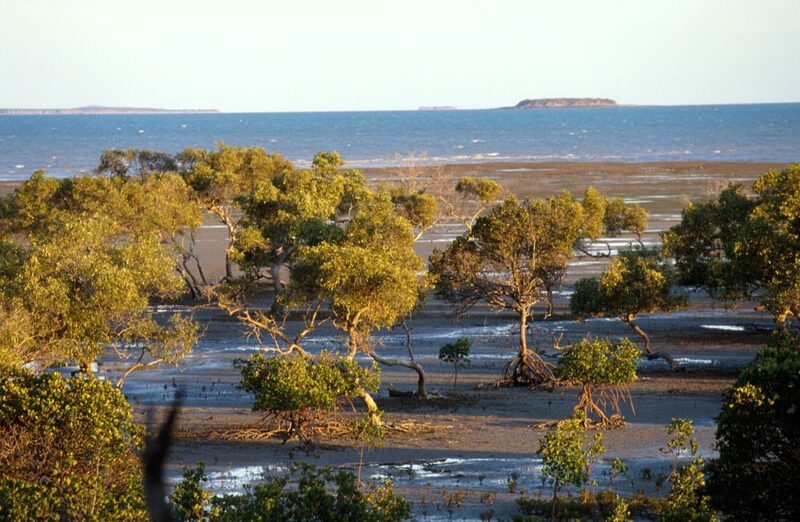 Mangrove ecosystems formed as a result of the large tidal variation. Image courtesy of the Queensland Government.